Aristaless. When you look at the genes for neurodevelopmental disorders identified in modern-day exome studies, one gene is notably absent: ARX. The X-chromosomal aristaless related homeobox gene was one of the first genes for epilepsies and brain malformations to be discovered. Pathogenic variants in ARX can be identified in male patients with a variety of neurodevelopmental disorders including idiopathic West Syndrome – accordingly, ARX is on the differential list for patients with intractable infantile spasms without a known cause. One of the reasons why we hear so little about ARX is the fact that this gene is poorly covered in exomes. Furthermore, one of the major disease-causing variants is a repeat expansion that cannot be assessed through exome studies at all. Here is a brief summary of what we know about ARX in 2017. 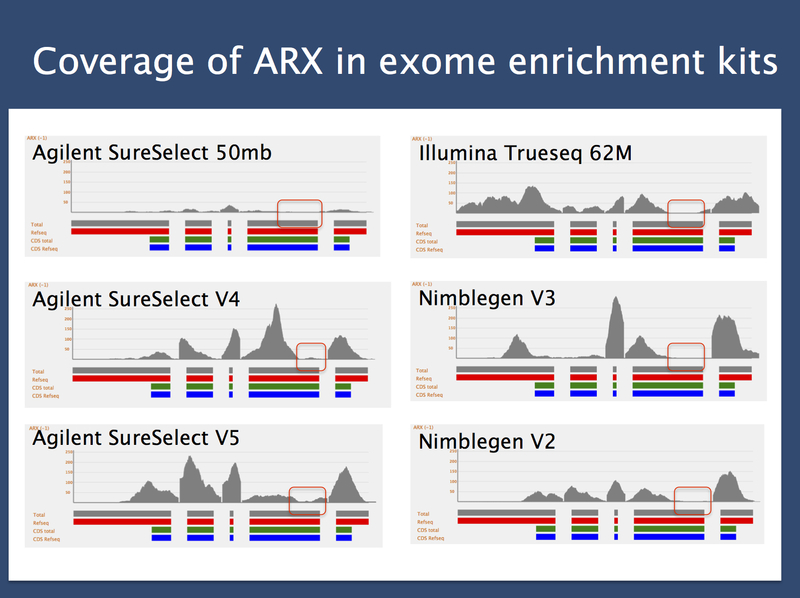 Coverage of ARX in common exome enrichment kits. The red, green and blue bars indicate the exons of the ARX gene, which is located on the X-chromosome in “-” direction, i.e. the first exon is on the right. The first half of the second exon harbors the sites for the pathogenic polyalanine expansions, which lead to Infantile Spasms. These regions are not covered in most exome enrichment kits (red box). The coverage plots were generated by Holger Thiele, Cologne Center for Genomics using the Varbank tool. Gene expression. This post is an introduction to our ARX Epilepsiome page that was written by our genetic counseling intern, Kathleen Kenley. However, in addition to reviewing known epilepsy genes within our Epilepsiome project, there has been another angle to the ARX story that has developed more recently. When Markus von Deimling joined us in Philadelphia last year, his mission was quite clear. Markus is one of our Kiel medical doctoral students and the current pioneer of what will hopefully become a regular exchange of students from the University of Kiel to the University of Pennsylvania. Markus’ goal was to understand what ARX really does, which was the main reason he joined the Marsh lab at the Children’s Hospital of Philadelphia. Why the interest in ARX, you ask? Other than being an interesting gene in itself, ARX is also important because it is a master regulator of interneuron development and interneuron function, orchestrating interneuron migration and maturation. Therefore, if you would like to move beyond channels and synapses, ARX is probably a good place to start. Currently, Markus is completing his work on interneuron gene expression in ARX-deficient mice and we are expecting his first results that will give us a clue on about how ARX regulates gene expression in interneurons. Exome to genome. If we look at over 4,000 trios sequenced within the DDD study, we only find a single trio with an ARX de novo variant. This very low frequency is a good indicator of what we can expect from exome. We would expect to find an ARX de novo variant under the rare circumstances that such a variant occurs and that the insufficient exome coverage in the ARX region will allow for it to be identified. The main question is whether the low variant frequency in patients or the low coverage in the exome is the main cause of the “ARX dropout” that we are seeing. Given how frequently ARX was initially reported in the literature, the rate of 1:4000 in patients with neurodevelopmental disorders seems unusually low. We will know more about ARX once large-scale studies have been performed on a genome-level or on gene panels optimized for the detection of ARX and the associated polyalanine repeats. What you need to know. The ARX disease spectrum spans a group of neurodevelopmental disorders in males, including lissencephaly, X-linked infantile spasms, and non-syndromic intellectual disability. Phenotypic features, especially the presence or absence of brain malformations, correlate with the type of mutation. ARX is probably underdiagnosed given that this gene has overall low coverage on most exome kits and given that one of main pathogenic alterations is a repeat expansion. You can read more about ARX on our Epilepsiome page. This entry was posted in 2017, ARX, Epilepsiome and tagged ARX. Bookmark the permalink.